I am a registered nurse yet I do not work in a hospital...I just go with where life takes me...I love to write... or used to love to write.. then again, maybe I am not a writer. I blog about anything from fashion, beauty,travel, recreation, food and other random thoughts.Please pardon my future posts for its poor composition, I just want to share some of my thoughts, my ideas, my latest travels, my latest gastronomic adventure and all other daily endeavors. This what your helloviellobits! 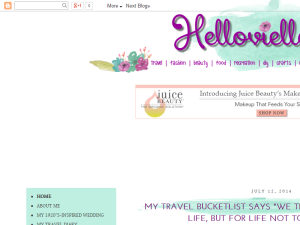 Blog Ad will look like to visitors! Of course you will want to use keywords and ad targeting to get the most out of your ad campaign! So purchase an ad space today before there all gone! If you are the owner of helloviellobits!, or someone who enjoys this blog why not upgrade it to a Featured Listing or Permanent Listing?